American-made and engineered roll-formers that make money! Give the exterior look of real wood logs, with steel! The EM 8 Log portable seamless siding machines are robust and the profile is extremely realistic. This user-friendly machine is designed, engineered and made in the USA. The patented roll-forming profile is unique and looks great on the wall. 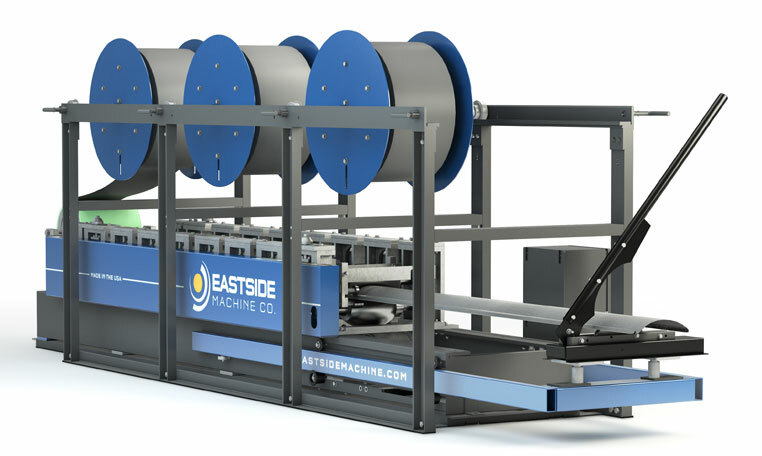 Eastside's siding machines feature our original self-contained embossing system, which applies a natural wood grain texture to steel coil. The EM 8 Log job site roll-former is a smart add for those looking to expand within the siding industry whether purchasing or renting the portable log machine. With the maintenance concerns and upkeep of conventional real wood log siding, it is no surprise that a metal alternative is a big hit. Our patented design (patent design USD#462,790) gives the exterior look of real wood logs, made of steel. This profile looks impressive on large homes that want to look of a log cabin and fantastic in most commercial applications. It is important to be aware that this profile does require a custom foam backer that not only supports the profile, but also gives added r-value. Portability, durability and product flexibility are just three of the many compelling reasons to choose an Eastside Machine Company built seamless siding portable roll-former. To be successful in the siding industry you need to be productive with your assets. Down time costs you money! With Eastside Machine Company's portable roll-formers, you’ll have peace of mind knowing that you bought an American-made and engineered roll-former that will make you more money. Our team is experienced and ready to help you with any questions from machine support and use to installation. The Eastside EM 8 Log job site roll-formers are built upon a heavy-duty steel frame for structural stability and forming consistency. Industrial nitrocarburized (QPQ) steel rollers are used in all Eastside Machines. Nitrocarburizing rollers allow for improved wear, lubricity, strength and corrosion resistance. Our proprietary embossing rollers, which apply an authentic and natural wood grain texture to steel or aluminum coil, are artfully designed for pattern beauty and panel rigidity. An extendable cutting table gives you the flexibility to make your cuts more precise. Our portable siding machines operate with a 1.5 HP 115 Volt, 20 amp electric motor and have a variable speed frequency drive. This allows our seamless siding machines an infinitely adjustable forming speed from 1 ft to 60 ft giving you the ability to do more production than other machines on the market. Our siding machines also come standard with an extendable remote switch with forward and reverse, allowing machine operation from outside the trailer. Eastside Machine Company knows the importance of making loading and unloading coils as safe and simple as possible. With Eastside Machine Company siding machines, your installers/operators can load and unload coils without using a forklift, like most other portable siding machines. An accessory coil loading system can be mounted to your enclosed siding trailer and can effortlessly lift coils up to 2500 lbs in a matter of minutes using a 110-volt winch. Safety is very important at Eastside Machine Company and it is something we take very seriously. All our siding machines are equipped with an emergency shut-off button and a spool brake to control the coil when operating the machine. Like all Eastside Machine Company portable siding machines, our EM 8 Log Siding machines come with operational training and technical support and a five-year warranty. Controls: Extendable push button control with tethered remote control and 10' cord. Emergency shut-off switch at entry end. 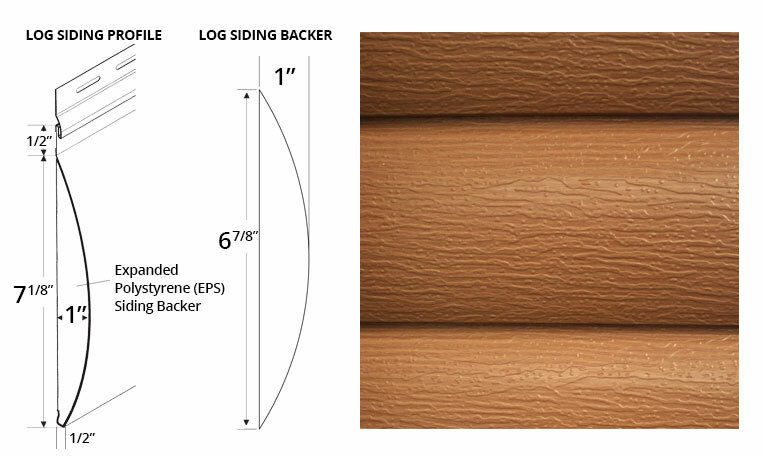 The attractive log siding profile is exclusive to the EM 8 Log job site roll-former. This unique profile was designed to give the appearance of a log cabin exterior for both residential and commercial applications. We recommend using a custom contoured foam backer engineered specifically for the EM 8 Log profile. This precisely contoured foam underlayment adds rigidity and superior impact resistance. It is available to order as needed. To learn more about the benefits and importance of the custom foam backer, call customer service at 1-800-234-7834. Eastside Machine offers a guillotine cutter standard on every seamless siding machine. Industrial nitrocarburized steel blade gives a very desirable, clean cut. The durability of the blade allows it to keep its sharp cutting edge, which minimizes maintenance; think of an Eastside Machine Company guillotine cutter as comparable to the Ginsu knife’s role in a kitchen. Unidrive is an AC Drive and Controller system with integrated Programmable Logic Control (PLC), and comes standard on all 2016 and newer 6/8/10 Combo Siding Machines. The Unidrive converts single phase 110V to 3-phase 220V without the need of a transformer, resulting in a much more efficient use of power. Unidrive benefits include: less power used, fewer circuit breaker and GFI outlet problems and the ability to add the ATM system to your Eastside portable siding machine. Have an older Eastside Combo Siding Machine with Softstart or Phase II Electrical? Unidrive can easily be added to 2015 and earlier models. Just call customer service at 1-800-234-7834 to learn more. The Auto Tape Measure (ATM) system will measure the panel length as it is formed. Cut lengths can be set in the ATM without the need of measuring. Batch any number of same-length panels to increase efficiency, all while adding convenience and accuracy on the job site. ATM is also a great way to track the total number of feet used (like an odometer in a car) or the number of feet used during a single job. ATM is an upgrade that can be added to any Eastside portable siding machine with the Unidrive system. To learn more about the benefits of ATM and how it can help your install teams be safer and more efficient both in accuracy and speed, call customer service at 1-800-234-7834. Eastside Machine Co. and its affiliated companies are your one-stop shop for anything related to the siding industry. We can help you finance your machine purchase, and you can buy coil and accessories from our sister company, EMCO Building Products. We can also provide dealer and marketing support and have available programs for interested parties. In addition, we also sell ReechCraft access equipment. Our customers are very important to us and we look at every customer as a lifelong partner in the exterior products industry. Eastside siding machines are best suited in an enclosed and insulated 16-foot tandem axle trailer. We sell quality, American-built, heavy-duty trailers designed for this industry. Most people who purchase a trailer from Eastside Machine, purchase with a coil cradle for safe, easy and forklift-free loading. As far as standard features, our trailers include an 8-foot fluorescent interior light, two 110V interior receptacles, a two-circuit panel with lifeline for a 110V, one heavy-duty aluminum access ladder and a 14-foot ladder rack and cat walk. 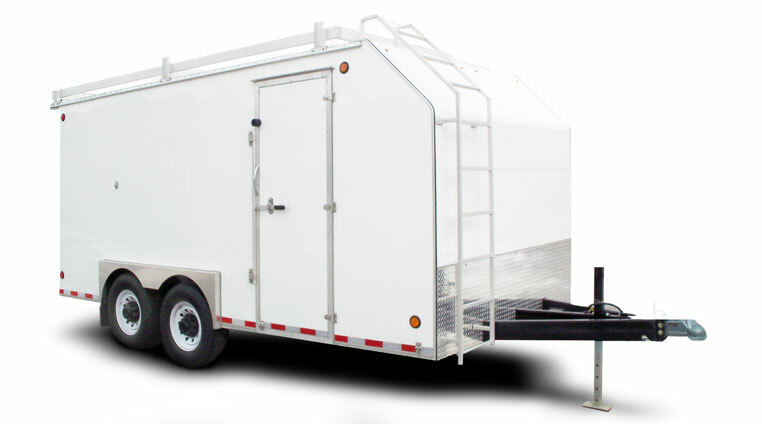 Our enclosed trailers are made of white aluminum (0.040 gauge). 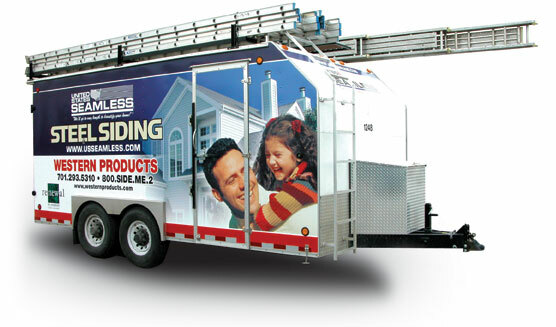 If you choose to purchase your enclosed seamless siding trailer from Eastside Machine, we can offer you custom graphics design and installation for your trailer. Our in-house marketing department will work with you to create a truly eye-catching portable siding machine that is not only a key profit area for your business, but also serves as a billboard. We also offer a dealer program, known as United States Seamless. To learn more about United States Seamless, click here. To learn about our dealer programs, marketing, graphic design and install opportunities, ask one of our customer service team members or our sales associates. Easily load coil without using a forklift! 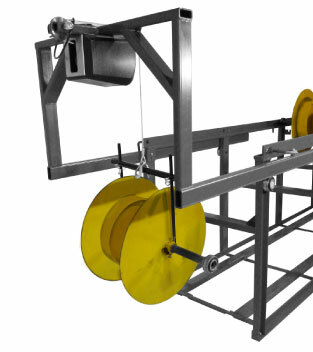 This cradle mounts to all siding machines and can be customized for the Eagle 5" Seamless Gutter Machine. Thinking about getting into the seamless siding business? Are you in the seamless business but not sure if you are ready to add another job site machine? Looking to run a special profile or attachment? Consider Eastside Machine’s Rental Program. If you’d like to learn more about the rental opportunity, call 1-800-234-7834 or email us at info@eastsidemachine.com to learn more details and find out availability. The EM 8 Log Machine can run as a standalone business in areas where log exteriors are prevalent. If you are interested in a more comprehensive exterior siding program, invite you to explore the opportunities to grow your business with a United States Seamless dealer program. United States Seamless, Inc. is one of the leading home improvement dealer opportunities for seamless steel siding, accessories and seamless gutters products. We're a goal-oriented company looking for self-motivated individuals within the home improvement or construction industry who can see themselves growing their business by partnering with a proven affiliate dealer program centered on best practices, great products and a great brand name. Do I have the ability to lead employees and crews? Will I serve customers by providing them honest information in a professional manner? Do I want my customers to receive the best value for the money they will spend for quality home improvement products? My Eagle gutter machine just keeps the money rolling! The Eagle is the best investment I have made for my gutter business. It's fast, efficient, and is extremely reliable.